5. SPECIALS ON NOW!! /pro­duct-cate­gory/citrus-based-clea­ner/spe­cials-o..
7. Cit­rus Hand Grit /pro­duct-cate­gory/citrus-based-clea­ner/citrus-han.. 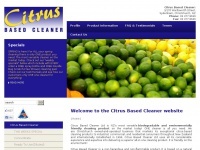 The web server used by Citrusbasedcleaner.co.nz is located in Christchurch, New Zealand and is run by Digiweb New Zealand Limited, Christchurch New Zeal. This web server runs 2 other websites, their language is mostly english. A Nginx server hosts the websites of Citrusbasedcleaner.co.nz. The website uses the shop software system WooCommerce The website uses the latest markup standard HTML 5. The website does not specify details about the inclusion of its content in search engines. For this reason the content will be included by search engines.